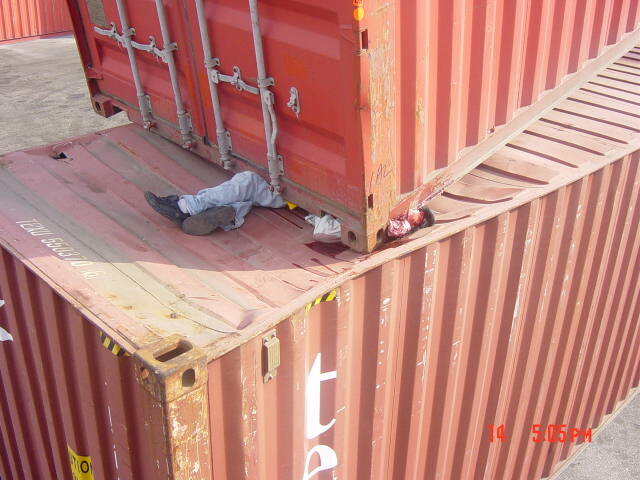 Container crush – disturbing image. The following photo is a disturbing image and we gave considerable thought to whether or not its publication would serve a useful purpose. It’s from the Blue Oceana website and tells more than any official report possibly could of the need to be safety conscious around containers. It is from an accident in Malaysia in 2005. As the Blue Oceana makes clear, it’s a continuing problem. An inland cargo ship was detained yesterday by Chittagong Port Authority (CPA) on charge of creating risks of serious accident in the port channel. But stepped-up maritime patrols off the west African coast by the European Union border agency Frontex have led to a dramatic reduction. The vessel was moored off the southern side of Te Wero Island when the Harbourmaster notified emergency services it was taking on water.